For how many years you have been performing at the Fringe and what made you start? I reckon this is my 10th year at the fringe. I’d been building up my work in traditional music outside of the orchestra for a few years and made my first solo fiddle album in 2004 so coming to play in Edinburgh at the fringe seemed a great way of expanding the audience and getting my music out there. Can you tell us more about your music? How would you describe it? 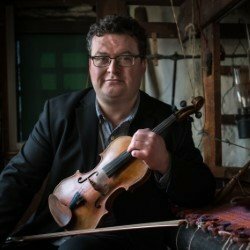 It’s really a broad spectrum of Scots fiddle history, everything from the 18th century classics linked to Rabbie Burns and the great Perthshire fiddle composer Niel Gow, through the 19th century with people like James Scott Skinner and then into the 20th century including my own compositions. I like to explore the geographical links in the music too, so I feature music from the Scottish Islands and music associated with the bluegrass elements of North America. Can you explain to us your show’s title “Alastair Savage, Alone with History”? Is your music related to Scottish history or its heritage? Yes, the title of the show relates to my most recent album called ‘Alone With History’ recorded in Crathie Kirk, near Balmoral Castle. The album is completely solo fiddle without any accompaniment thus the title and also tries to show how each composer in Scotland’s past stands ‘Alone’ and is unique in their own way. There is a strong historical element to the show and hopefully giving Scots and people from overseas a special look at Scotland’s proud musical heritage. You are also part of the Celtic band with which you released 3 albums, we are impressed! Can you tell us more about your last album? The last album was actually unaccompanied but before that yes, 3 albums made at Scottish singer/songwriter Dougie MacLean’s Perthshire studio alongside my trio with Euan Drysdale and Iain Crawford. Much of those albums is new original music written by myself and arranged by the trio. Some of our music has been used by BBC Alba and we’ve broadcast several times on BBC radio.